Exercise with oxygen therapy is a tested treatment option for a variety of medical conditions. It has helped patients overcome a plethora of symptoms and regain their quality of life. For those who are looking to garner change and want to make the most of their treatment regimen, it’s time to look at the benefits of exercise with oxygen therapy. These advantages are going to become prominent as they’re implemented as required. Please note, these benefits have been seen with patients who are suffering from cancer, and that illustrates the potency of it as a therapy. The body can start to see cell damage with conditions such as cancer. This is where the cancer starts to damage your body because it thrives in oxygen-depleted conditions. If those conditions remain the same, you are not going to see a positive change in the long-term. 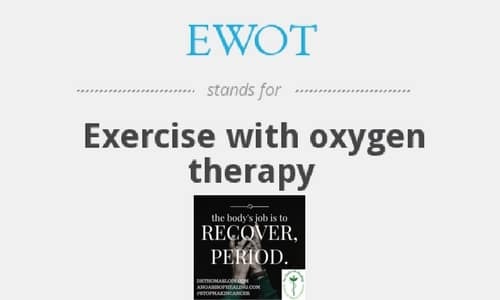 By participating in EWOT or “exercise with oxygen therapy”, it enables the body to have an oxygen-rich environment. This can help the body’s immune system fight off illnesses and adverse conditions such as cancer. This benefit is a major reason to consider this therapy and all that it has to offer. The body needs physical activity and those who are not exercising will struggle with their overall health. This therapy helps elevate the body’s health by getting the heart pumping and delivering oxygen directly to the cells. By getting the heart pumping, it’s easier to see a plethora of advantages health wise. The body starts to adapt to the new stress added to it and will optimize itself for it. Remember, the human body is a wonderfully complex machine that needs to be maintained by living within the laws of nature. EWOT is an excellent way to do this and will help generate positive changes for your health especially with conditions such as cancer. Don’t ignore how efficient it is and the positive impact it has contributing to your overall health. People with cancer tend to cite a depletion in energy levels as their condition wanes. To make sure those energy levels don’t deplete and remain low, it is important to consider exercise with oxygen therapy. This is one way to feel healthier and gain a boost in your energy levels as soon as possible. Once the sessions begins, the changes are noticeable. Plus, there are additional advantages to exercising such as seeing faster muscle growth and gaining in endurance. These benefits are important and help with your battle against cancer or any other medical condition. Keep these advantages in mind as you are striving to restore your health because it is important to use all of the options available to you. This is a tried and tested option that has been used by several people with cancer with great success. Those who are looking to optimize their treatment and get more out of it need to consider EWOT as soon as possible. This is a compelling option that is going to refresh your body and give your immune system the kick-start it requires for health restoration. EWOT therapy is just one of our many adjunct therapies that is part of our comprehensive cancer care program.